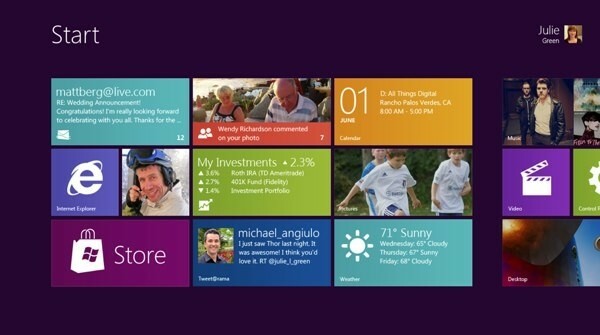 Microsoft has just released a developer preview of their upcoming operating system Windows 8. Users from all over the world can download the preview and install it on their systems. There is only one restriction with regards to the installation: You cannot update an existing copy of Windows, the Windows 8 installation requires a clean install. I thought it would be perfect for my Acer notebook. It is fairly underpowered by today’s standards, and does not come with a DVD drive which I could use otherwise to install Windows 8. The only viable option in this case is to install from USB keys, sticks or drives. Installation is a little bit difficulty, as it requires more preparation than just burning an ISO image to disk and putting that ISO into the DVD drive of the computer. You need an USB key with at least four Gigabytes of free space. The first step is to format the key with the FAT32 file system. This is done by connecting the USB key to the computer, right-clicking its drive letter and selecting Format from the options. 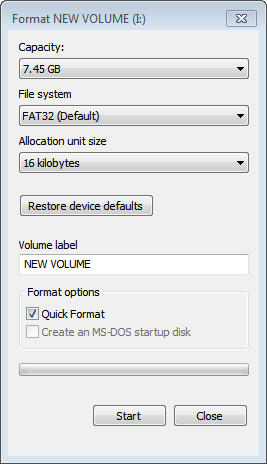 The Format window pops up where you need to make sure that Fat32 is the selected file system. Everything else can be left as is. Wait until the formatting has finished. You now need access to the Windows 8 ISO or DVD. The developer preview is only provided as an ISO image. Check out Windows 8 Download for instructions or download the developer preview right here. The easiest way to copy Windows 8 to an USB drive and make that drive bootable at the same time is to use Microsoft’s Windows 7 USB/DVD Download Tool. While designed specifically for Windows 7, it appears to work just fine to create a bootable Windows 8 USB key as well. Just select the Windows 8 ISO when asked to pick an ISO image from the computer. Then select to copy the contents to an USB drive. The program will copy all files to the drive and make that drive bootable at the same time. You can download the Microsoft tool from here. You plug in your USB key into the computer you want to install Windows 8 on. You need to tell the computer on first start to boot from USB and not from hard drive or another location. This is done in the Bios. You usually enter the Bios with F1, F1, Delete, Esc or another key that is highlighted on the screen on Post. Press that key and look for an entry that says Boot or Boot order and make sure that USB has the highest priority on the system. You can easily repeat the steps if the computer is not booting from USB. The computer should pick up the installation files on the USB drive automatically and installation should commence. If you want to install the Windows Developer Preview, but have no blank DVDs or usable thumb drives, fear not. It’s fairly simple. This assumes you are installing the preview on a computer already running Windows, of course. 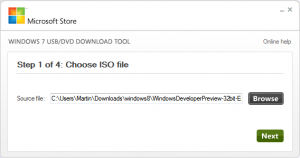 Download the ISO file from Microsoft. Mount the ISO using Daemon Tools, Clone Drive, or similar. This is important. Do not use the autorun installer. The autorun installer only allows you to upgrade your existing Windows installation and will not allow you to install to a separate hard drive or partition. Navigate to the virtual install disc and go to the folder called “sources”. Run setup.exe and proceed as if installing Windows Vista or 7.